Habitat for Humanity of Madison County absolutely loves our volunteers. As a matter of fact, we could not do what we do, if it were not for the many generous and willing volunteers in our city and community. We consistently receive calls, emails or have persons come by, who are interested in volunteering with us and we never turn volunteers away! So you may be asking, “How do I sign up?” Our process is really simple. We have a volunteer orientation class every two weeks on Saturday. Should there be a schedule change, we inform everyone by email and through our social media pages. Our next volunteer orientation class is scheduled for March 10, 2018, at 10:00am here at our office (400 Pratt Avenue, NW, Huntsville, AL 35810). To register to attend a class, please contact our Volunteer Coordinator, Traci Draper ([email protected] or (256) 533-2282, x153). Should you have a large group (more than 50), it may be easier for us to come to you to present the orientation. Once the class is completed, the volunteers will sign the appropriate paperwork and be dismissed. We are currently working on a system to allow volunteers to sign up through our website, but until that system is up and running, volunteers are scheduled through our Volunteer Coordinator. All volunteers who want to volunteer on one of our constructions sites, must be 18 years of age. If volunteers in your group are younger than the age of 18 years, you will need to contact our Volunteer Coordinator (Traci Draper), to put a plan in place to get your team scheduled. There are limited projects available on our construction sites for ages 14-17 years of age and these volunteers must have chaperones at all times. No one 13 years of age or younger, is allowed on our construction sites, however, there are other opportunities to serve as a volunteer with Habitat. 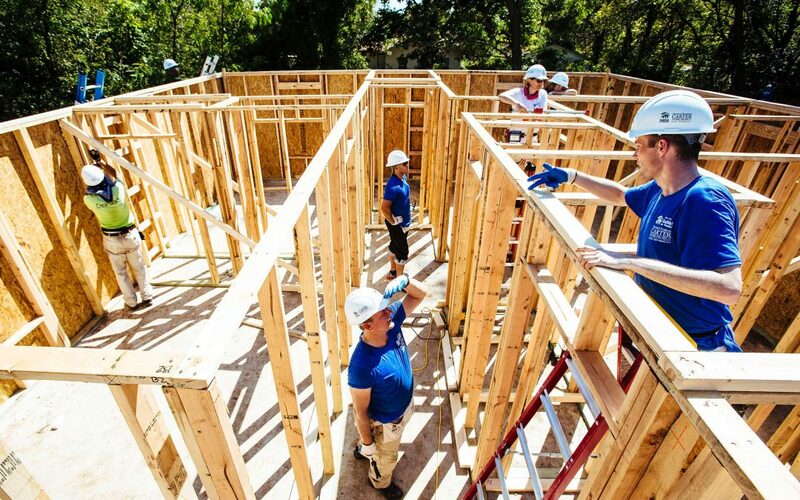 Again, we are truly thankful for all of our volunteers and as our Spring Build is beginning, we look forward to you joining us as we build dreams, one home at a time. If you are interested in donating to Habitat to ensure we are able to keep serving those in need of decent and stable housing, please visit our donate page by clicking here.